Everyone here likes chocolate, right? And if you don't, please leave now. I don't need that kind of negativity in my life. 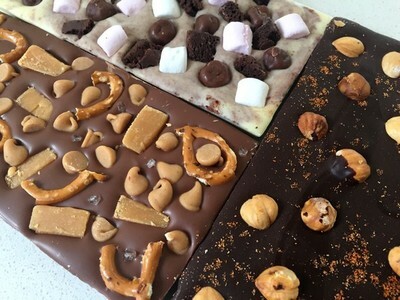 Get busy creating your very own custom block of chocolate. This review is a little different in that it doesn't so much discuss a café or restaurant, but a genius chocolate concept that, frankly, I'm shocked and appalled hadn't been thought of till now. The brain-child of two local Sydney-siders, Veronique Eldridge-Smith and Spencer Walden, Chocolab is pretty much a chocolate lovers dream. 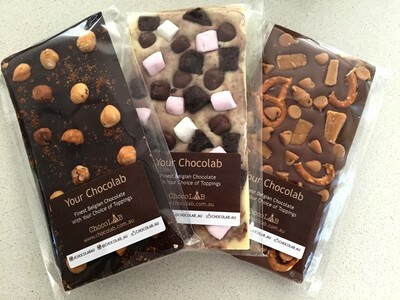 As you may have deducted from the name by now, Chocolab lets you get a little experimental with chocolate by allowing you the freedom to concoct your very own chocolate bar. Why no one thought of this sooner is totally beyond me. Take your fave 100 gram block of either white, milk or dark Belgian chocolate and become one with your inner mad scientist - add pecans and coffee, gummy bears and cookie dough, or peanut butter cups and chilli powder. With almost a hundred different ingredient choices, and more being readily added, the options are almost endless. The chocolate itself is fine Belgian chocolate made with 100 per cent pure cocoa butter and all natural ingredients - none of that cheap and nasty stuff that we all seem to gorge ourselves on every Easter - and you can actually taste and smell the difference, with this chocolate being richer and creamier than cheaper supermarket varieties. Creamy white chocolate, Milo, marshmallows, brownies and cookie dough. 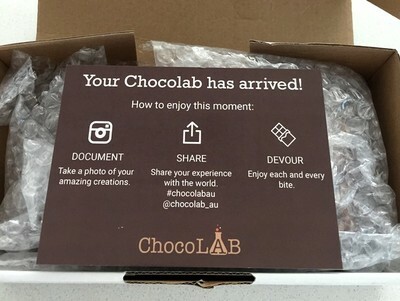 While I'd happily devour a block of that dark chocolate just the way it is, I feel as though this would go against everything Chocolab stands for, so with the help of my trusty lab partner we got to creating. 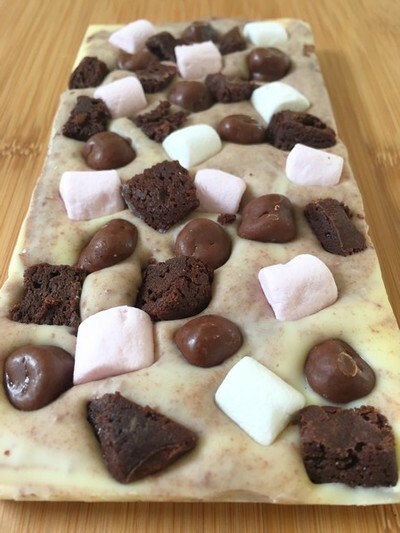 The first block, a white chocolate block, which I have affectionately called 'sweet dreams,' because it's my chocolate and I can, was mixed with Milo and topped with cookie dough balls, mini marshmallows and brownie bites ($10.35). Sweet and salty is definitely the flavour of the moment. 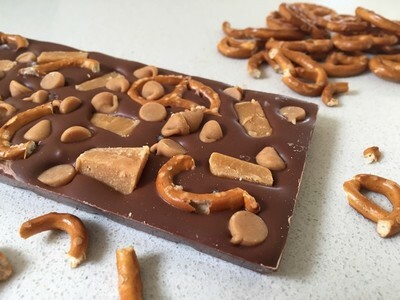 The second block, a milk chocolate block this time ($10.25) combined chewy caramel fudge, peanut butter drops, crunchy pretzels and a sprinkling of sea salt, which helped balance out the rich milk chocolate base. Rich dark chocolate made that much more intense with a little chilli kick. 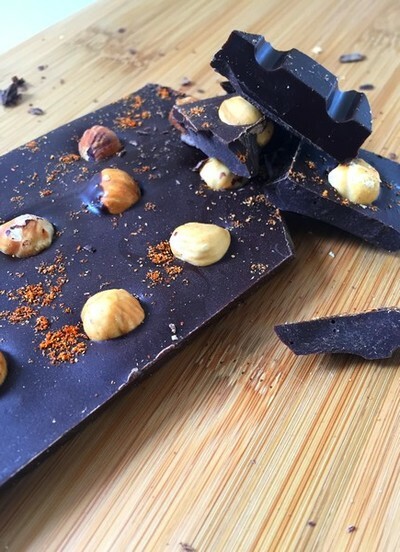 The third and final block, 'sugar, spice and all things nice' (yes my names are very original), found toasted hazelnuts ensconced in rich dark chocolate and topped with a sprinkling of chilli powder ($8.05) that added warmth and depth to the chocolate. This simple, 'mature' block was my favourite of the lot. Your chocolate should arrive safe and sound. The great thing about Chocolab is that there are no bad blocks, only bad choices - no one told you to mix sherbet, coffee and acai berries together (although this could be interesting). Better still, Chocolab is not limited to Sydney. Posting Australia wide, these tasty creations make for a great indulgence, or, if you feel like sharing, a gift for someone special. All up, from ordering through to devouring, the process only took a little over a week, and while I was initially concerned as to what state my chocolate would arrive in after going through the Australian postage system, I was pleasantly surprised to find my sweet treats wrapped in bubble wrap and nestled safely in a sturdy cardboard box. Cost: From $1.50. Creation blocks from $6.50. When: Order anytime. Shipping takes between 7-10 business days for most areas.